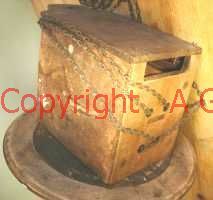 Both the side doors are intact and the joints of the main case are firm. 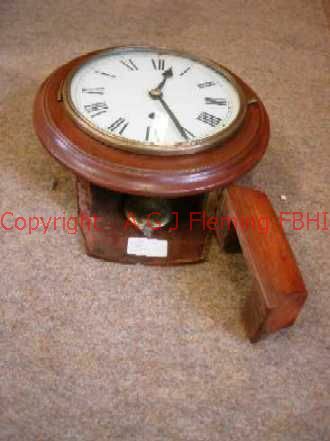 It has a glass dial (painted on the reverse as you would expect) and comes with replacement weights and a new pendulum. All parts are held together in the original manner with taper pins (not with steel angle brackets) though the back has additional screws into the top & bottom wooden 'plates' for safety. 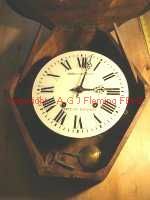 This is a French wall clock which shares a peculiarity with French longcase clocks in that it strikes the hours twice - once at the hour and again a couple of minutes later. In fact the movements are almost identical - with only the gear ratios (to allow for a shorter pendulum) and the motive power being different. 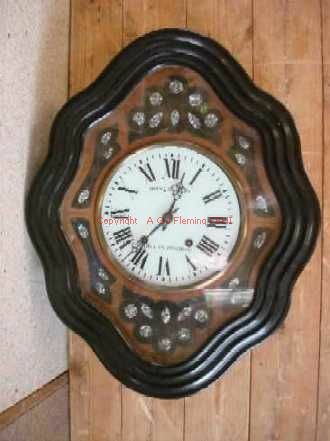 It is a highly decorative clock, with mother-to-pearl floral inlay in dark wood panels in the pale wood ground, all covered by glazing inside the ebonised outer bezel. This makes the front quite heavy, which normally presents a problem for the hinges at the top of the front as there is generally only one prop to hold it open for winding - resulting in quite a twist. 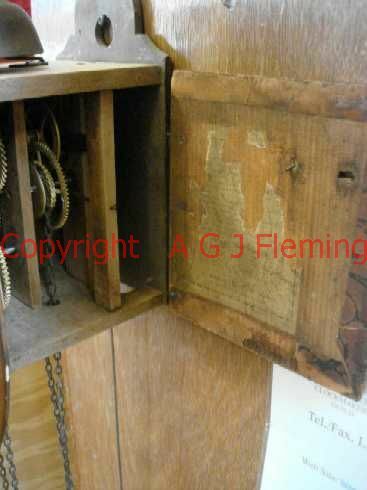 However this clock has one on each side so the hinges are not put under strain. The dial on this clock is the better quality glass one, painted on the reverse and held to a metal backing plate by the hole-grommets. 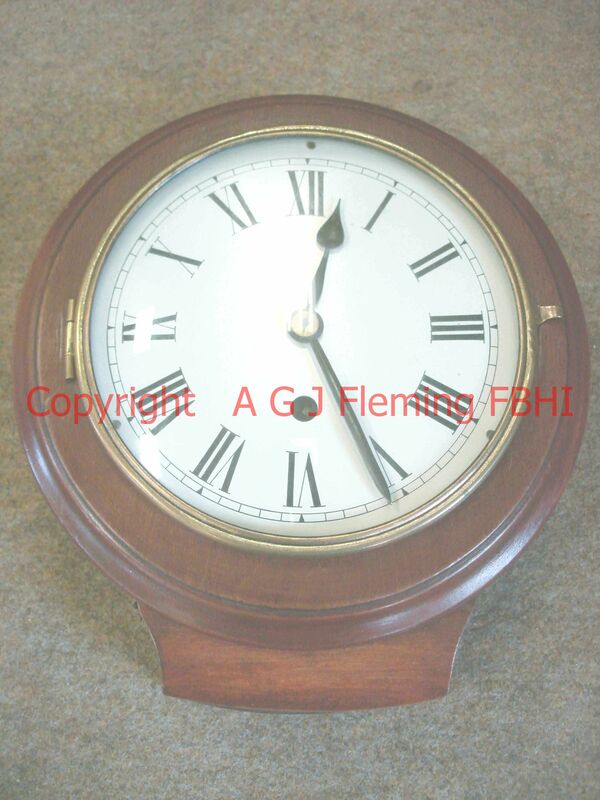 Here I am selling a small drop-dial clock with a German movement of good quality but unidentified maker. 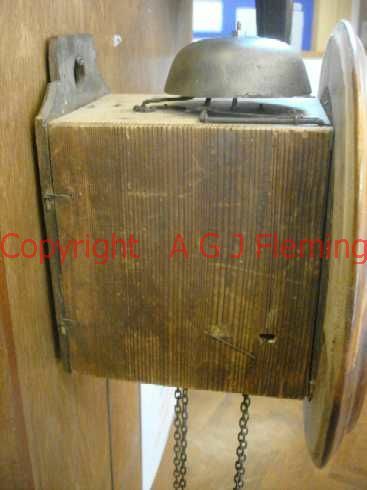 The 'drop' is hinged on the right side with a latch on the left, swinging down in front of the back board (which continues to level with the bottom of the drop) to reveal the pendulum. It has a nice clear dial, with good colour to the wood. Maximum dimensions: wooden bezel is 240mm diameter, the 'drop' below it is 23mm,it is 100mm deep, and the dial is 170mm diameter. 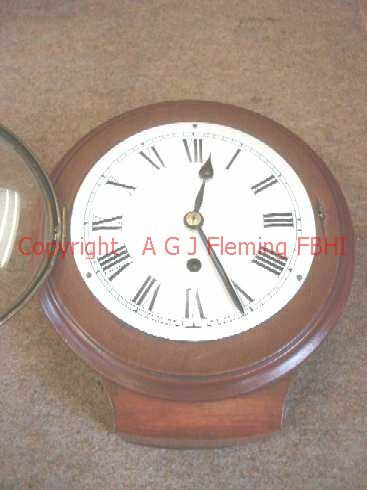 This is a standard Office Dial clock with a fusee movement of good quality. 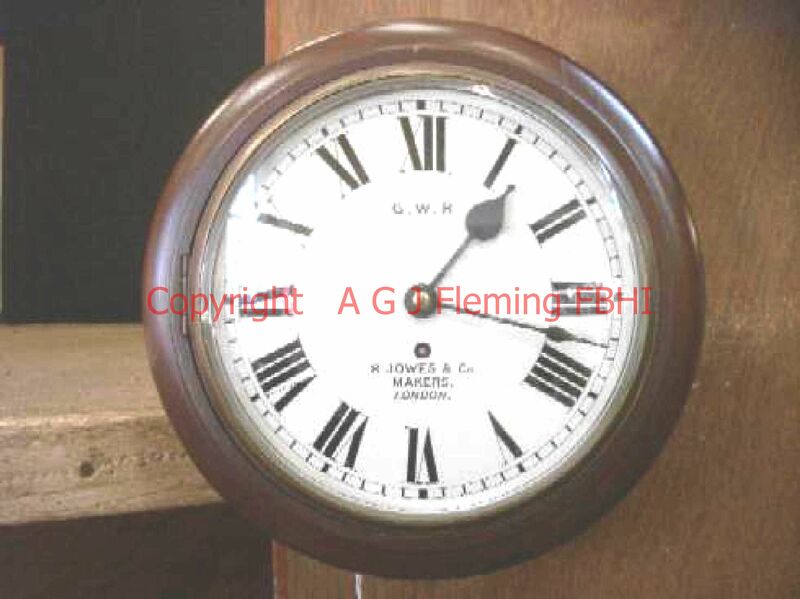 The case seems to have been re-finished, and I have not checked on the authenticity of the GWR or the name on the dial. The dial has been re-painted for me - with nothing added or removed - after re-riveting two of the dial feet. The movement is resonably modern as fusee movements go, so should give a lifetime or two of good service! & Frodsham. I estimate the date of the clock as C.1830. case diameter: 7” or 178mm, case depth: 2” or 51mm. This is a particularly nice example of a small dial clock, with a slightly convex enamel dial signed French & Son / London. 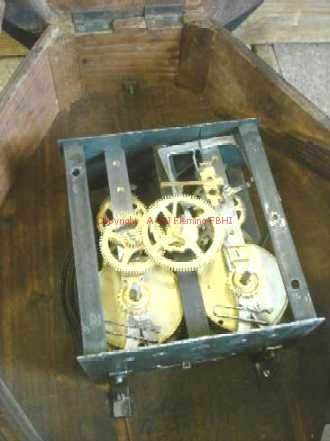 It has a late model of fusee movement, with plain pillars screwed at both ends. The back plate is stamped 6472 / LONDON just to the right of the bottom left pillar. The movement is secured in the case by two steel straps running vertically behind the dial, not to the dial plate itself so that the enamel will not get damaged. There is a slight chip to the bevelled edge of the 4mm-thick front glass (at about 9 minutes past), and there has been some repair-work to the case - but what would you expect? The visible part of the dial is 3.5" diameter, with the inside of the minute tramline at 3.1". The dial (with the movement fixed to it) is attached to the back of the bezel which is hinged onto the bowl of the case. The back of the case is numbered 1756. The movement cover is stamped Smiths Clocks & Watches Ltd, there is a lable on the inside of the back of the case saying MARTON PRODUCTS / 61A De Beauvoir Road / London N1, and the dial is 'signed' Marpro above the centre and 8 DAY / T. MORRIS / THE QUAY / LYMINGTON below the centre - Smiths made the clock, Marton were the wholesalers and Morris the retailer I think! This is an excellent Vienna Regulator with half-hour strike by Gustav Becker - one of the big names for this type of clock. It has a 2-piece dial with a recessed centre, both parts being enamelled; and comes with original weights, pendulum & winding key. As with the vast majority of Vienna Regulators, the pendulum has a wooden rod, ensuring almost zero variation in rate due to temperature or humidity changes. Maximum dimensions: Height ~ 41" (the top finial being ~ 10" above the hanging plate), Width 17 3/4", depth 7"
This is a bit of fun really. It is a reproduction of the sort of clock that was produced many years ago - though they would mostly have been made of metal. The rate at which it runs is controlled by the weights on the oscillating arm (or 'foliot') at the top - the further out they are the slower it runs. It ticks about 40 times a minute - very slowly! Even so it need a 6'6" drop for the line & weight in order to run for a full 24 hours. This means the dial centre needs to be at 7' above the floor, with a ceiling height of not less than 7'9" (2.36m). It is probably designed to be wound twice a day, with the dial at face height. The back of the back bard is stamped HELO / No Jewels / West Germany / unadjusted - which I think must be a bit of bureaucracy gone mad! 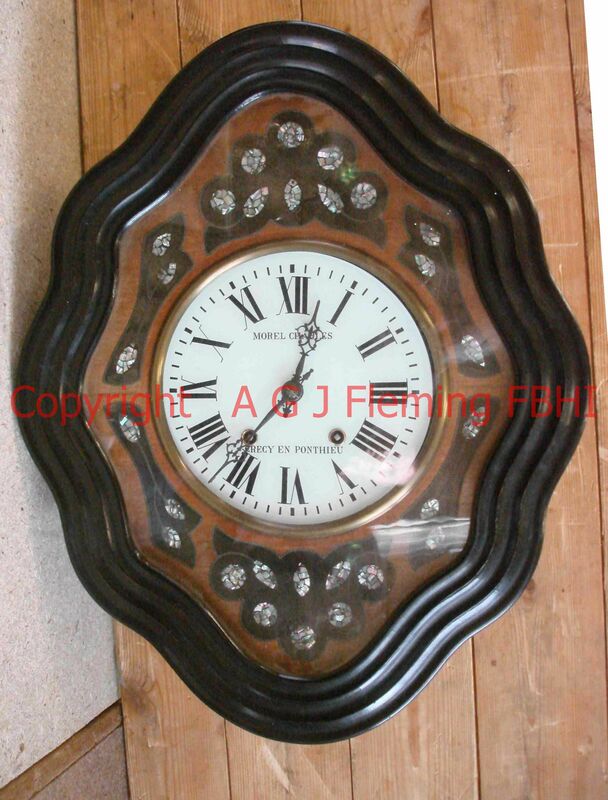 A 'classic' Black Forest clock with alarm, & was probably made between 1830 & 1850. The alarm runs until the weight hits the ground or is taken off, or you re-set the time it is due to ring... 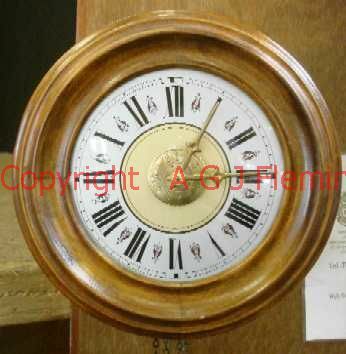 This clock has the break-arch or shield shape of wooden dial, which has had a split repaired. I have made up a pair of diagonal stays to go between the uprights of the frame (one each side), in order to help prevent the weights pulling the front down and causing the pivots to bind in their holes. Max dimensions: 14" high x 10" wide x 7.5" deep. Buy this now - phone 01451 8101 with your card details! 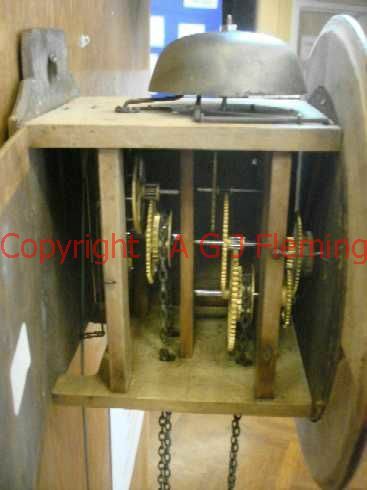 Here we have a typical brass-cased bulkhead clock with a platform escapement. Because Elliotts put low quality 7 jewel platform escapements on their clocks I have replaced the platform with a high quality 11 jewel one, and it runs beautifully. There is some minor scratching to the dial around the winding hole & out to the VII, and the lacquer on the body of the case is showing some signs of it's age, but otherwise it is in good condition, undented, and with no chips to the glass, and with a positive"snap" when you close the front bezel.